A professor once told a colleague of mine that he could tell which teachers were good classroom managers. He’d just watch to see who could quickly get students’ quiet attention. Those teachers, he said, would have more time to teach—and calmer classrooms. As a classroom teacher, I found “quiet” signals to be one of my most valuable management tools. But in my work as an elementary school consultant and coach, I’ve discovered that many teachers don’t know how to use these signals. 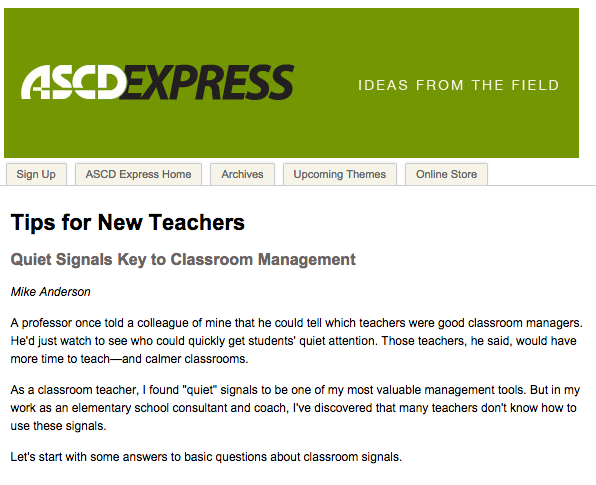 Let’s start with some answers to basic questions about classroom signals. What makes a good signal? Good signals are simple to use and easy to see or hear. It’s best to teach two signals—one visual and one auditory. When all the children can see you easily (for example, during circle time or when they’re all facing you for direct instruction), simply raise your hand. When students are scattered (for example, on the playground or working in pairs or groups), try using a chime or other instrument loud enough to be heard above their voices but still soothing and pleasant. What happens when you use the signal? When you signal, children finish what they’re saying or doing, put tools down, and look at you. If you’re using a visual signal, such as a raised hand, you may want students to mimic you as a way to “spread the signal” to classmates. 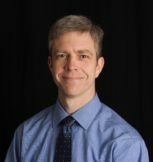 Depending on students’ age and needs, you may want them to put both hands in their laps when you signal, or to cross their arms on their chests. Such actions emphasize for children that they need to be still and attentive. How do you teach signals? When should you introduce signals? Many teachers introduce quiet signals on the first day of school. However, you can introduce them at any time during the year and reap the benefits. Wait until everyone is quiet before you speak. 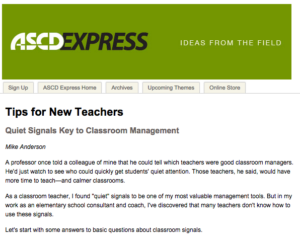 Waiting tells students that you expect everyone to respond to the signal. Use signals consistently. Saying you’re going to use a signal but then failing to do so consistently may confuse children: Do you really mean what you say and say what you mean? Reteach, don’t repeat. Repeating a signal teaches students that they needn’t comply right away; they can wait for the second (or third) repetition. If students don’t respond when you signal, it’s time to reteach. Using quiet signals is one of the greatest gifts you can give yourself and your students. Not only are signals respectful, effective, and calming, but they also send students a very important message: We expect all of them, not just some, to listen and learn.